The In-Sight 5400R is the size of a C-cell battery. 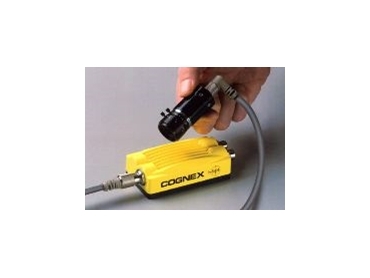 COGNEX Corporation has announced the In-Sight 5400R, a remote-head camera version of the industrial-grade In-Sight 5400 vision sensor. Available from Intelligent Vision , the In-Sight 5400R is ideal for applications where mounting space is limited, or a lightweight camera is required. The In-Sight 5400R has a separate camera and processor that can be mounted up to 15m apart and connected by a cable. The camera meets IEC specifications for shock and vibration and achieve an IP67 (NEMA 6) rating to withstand dust and wash down. As with other In-Sight 5000 Series vision sensors, the In-Sight 5400R includes a powerful library of vision software for automatic identification, gauging, inspection and alignment, as well as built-in Ethernet communications and In-Sight Explorer software with advanced tools to simplify application development and network administration. PatMax, the industry's performance standard for feature and object location, is available as an option.